Also termed as peptic ulcer or gastric ulcer, this condition is caused when the internal walls of the stomach are damaged. The stomach’s walls are lined with layers of mucus to protect them against acid which is secreted in this organ for food digestion. However, these layers can be damaged owing to bacterial infection or several other reasons which lead to the excessive production of stomach acid. As a result, holes may develop in the walls of the stomach and the different symptoms will be experienced by the victims. Several symptoms are experienced by victims which indicate the formation of an ulcer. The severity of these symptoms varies from one patient to another depending upon how severe and prolonged the condition has been. 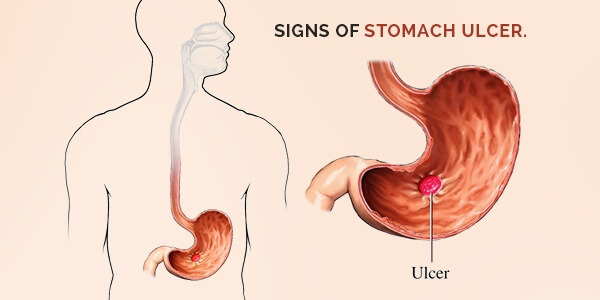 The signs of stomach ulcer are discussed below. The severity of the pain faced by the victims of peptic ulcer depends upon how serious the condition is. This pain may last for a few minutes or continue for hours. Similarly, it may be mild or excruciating. The discomfort is actually caused when the ulcer feels irritated. It occurs mostly after a meal which consists of irritants, such as spices. In addition, pain is also experienced when the stomach acid comes into contact with its damaged walls. Since the protective layer of mucous has been damaged, the walls feel sensitive to the acidity of digestive fluids in the stomach. The more the damage, the higher is the intensity of the pain. Furthermore, more pain is also experienced after a heavy meal or when a meal high in protein and fatty acids has been taken. These nutrients stimulate the production of acidic stomach fluids for the digestion of the food. The pain is reduced only through proper medication, such as anti-acids prescribed by a doctor. Another of the most common signs of stomach ulcer is heartburn and indigestion. Victims of the condition complain of a burning sensation, usually after a meal. This symptom is mostly caused by poor digestion of food and acid reflux. In the case of latter, acidic stomach fluid moves backwards, up the gastrointestinal tract. This is how it causes a burning sensation in the chest and may move up to the throat in severe cases. Patients lose their appetite owing to poor digestion of food, nausea and pain. Stomach ulcer affects the entire process of digestion and leads to a feeling of sickness. In such a situation, patients do not feel like eating proper meals. In addition, a fear also develops since pain and discomfort are mostly caused after meals. As a result, this fear keeps patients away from food. As a result of indigestion, regurgitation of food particles may occur. In some cases, blood may also be thrown up. This blood comes from the bleeding of the stomach walls which may occur in severe cases of peptic ulcer. Therefore, a bloody vomit indicates stomach ulcer. The loss of weight is inevitable owing to the issues associated with stomach ulcer. Poor digestion of food as well as vomiting prevents the proper absorption of nutrients from the food into the bloodstream. In addition, since patients also experience a loss of appetite, their intake of proper nutrients decreases and steady weight loss is experienced as a result. The overall health also deteriorates leading to obvious signs, such as dark circles under the eyes and paleness of the complexion, which prove how much suffering a victim is going through. Black stool is referred to as malaena. The color of the stool may become blackish owing to various reasons. However, generally, it indicates the presence of blood in feces. This blood comes from the bleeding of the damaged walls of the stomach. This blood is dark in color rather than red. In case the latter occurs, it is an indication of severe internal bleeding which requires urgent medical attention. Bloating is a condition marked by fluid retention. This is another of the signs of stomach ulcer. It causes abdominal swelling. Bloating is not painful, but is still a matter of concern for the victim as well as the physician. Patients suffering from the discomfort of pain, nausea, vomiting and other related symptoms of stomach ulcer face difficulty in falling asleep. However, the condition improves through proper treatment and timely medication. The loss of sleep is not a direct symptom of peptic ulcer. Instead, it is caused as a result of all the discomfort associated with the disease. Patients may or may not face the loss of sleep. However, over a prolonged period of time, it can further deteriorate the health condition. Individuals suffering from the above symptoms should immediately seek a doctor for proper diagnosis of the disease. This assists in relieving the symptoms and providing proper treatment. The diagnosis procedure may include the following. Endoscopy – viewing the inside of the stomach through an endoscope. Biopsy – examining a tissue sample from the stomach wall under the microscope. Barium X-Ray –detecting an ulcer or scarred tissue through an X-ray. Stomach ulcers may be formed at any age and both genders can be affected. Therefore, those who experience the symptoms should go for diagnostic tests and medical examination as soon as possible in order to avoid further complications and discomfort. In some cases, victims may not experience pain and other obvious signs of the ulcer. In this situation, blood in stool will be passed out as the condition worsens owing to the lack of treatment. This symptom should be given immediate attention. On the other hand, patients who do experience the early signs should seek prompt treatment in order to avoid making the ulcer worse. Along with medications, the patients of peptic ulcer should also take preventive measures such as avoiding spicy and fatty food. The medications and prevention can prevent further damage.